All of us have a dream. My dream is to paint and to bring forth the ideas that the Creative Spirit gives me. My aim is to create an imaginary world with the fantasy that lives within me. My art mixes elements of the invisible and visible plane, as well as the experiences from my childhood in El Salvador. To me the Universe is electric, and this electricity permeates throughout everything around us. 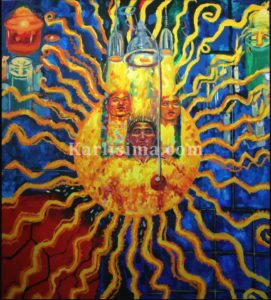 I use bright, intense oranges and yellows, and electric cobalt blues to express this electricity and energy, as in the painting called “I am the Light and the Energy” (See below). Title: “I am the Light and Energy” 6’x6′, oil on canvas. Collection of the Artist. Painting for Sale. Inquiries by Email. 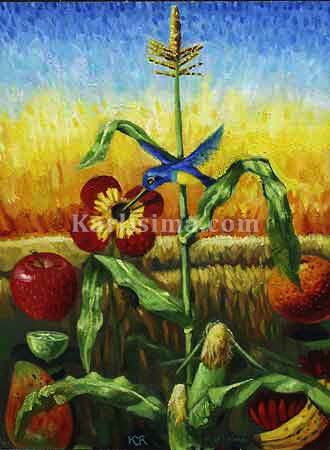 The Critics call my style “Latin Magic Symbolism” because it is a mixture of Magic Realism and Symbolism. It has its roots in my Mayan Heritage and my ancestors, the Shamans. We have a great reverence for Mother Nature, like all the natives around the planet. Our belief is that Mother Nature must be preserved, respected and cherished. We believe that we are One with the Land and as we take care of the Land, the Land will take care of us, for we are One. Mother Nature is an extension of ourselves. We must stop the abuse of the environment, the cutting down of trees, the drilling of the earth to get oil, and the depletion of the soil, in order to avoid self-destruction. The planet is crying out for help and the signs are loud and clear. I feel very passionate about taking care of our environment, our ecology, our planet. That is why I paint images in which I depict the beauty and splendor of Mother Nature. I paint with vibrant colors because of my Latin American roots and because I am fascinated by the brilliant colors of stained-glass windows and mosaics. I saw Notre Dame and Chartres Cathedral in 1989 for the first time in France at age 19, and so, I started to paint images which resembled stained-glass window motifs and the brilliancy of mosaics. 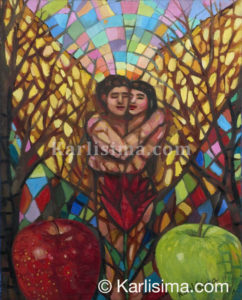 I use geometric shapes and fragmentation in some of my paintings to mimic the fragmentation of stained-glass windows and the black and dark lines around the contour of the shapes, such as in the painting called “Adam and Eve” and “Universal Oneness” (see below). 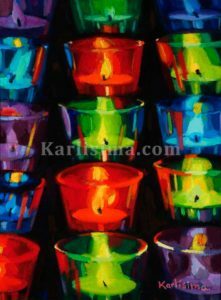 Title: Colorful Candles, 18″x24″, Oil on Canvas, Collection of the Artist. Painting for sale. Inquiries by Email. 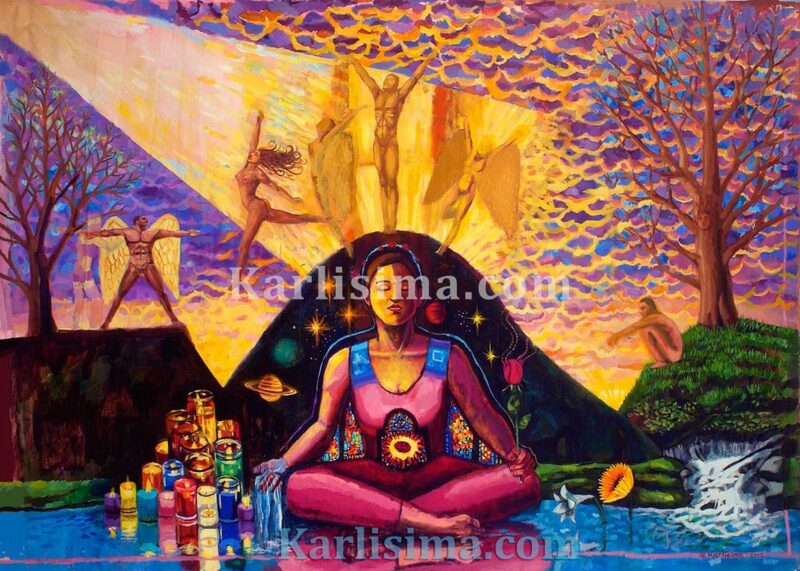 …and the painting called “On Mountain Top,” in which a woman is meditating and contemplating in front of votive candles, with angels coming on top of her head and from a beam of light. Title: “On Mountain Top,” 7’x 4′. Oil on canvas, Collection of the Artist. I paint with thick, impressionistic-pointillistic brush strokes. I have developed my own iconography with symbols of Mother Nature, such as corn, cornfields, fruits, trees, rivers, the sun, the moon, red roses, flowers, butterflies and birds. I use these symbols to represent the feeling of love, happiness, abundance and cornucopia, the bounty of Nature and the Universe. because I remember Sonsonate as a beautiful, luscious tropical paradise, a sort of ‘Garden of Eden,” full of rivers, particularly the river called “Pescadito de Oro” (The Little Golden Fish) in which I used to swim for hours, when I was a child. These childhood memories are very vivid and in my landscapes I aim to express an ideal place, a place which is beautiful like the Arcadian ideal, dream- like landscape in nature, like the one Cezanne and his friends used to dream about when he was painting the Bathers. I am an instrument of peace through which this Creative Spirit flows, and for this blessing I am truly thankful. May all of you be abundantly blessed, as I am also blessed by all of you. Title: “The Vision at the Rockcreek Park”, 3’x6′, Oil on canvas, collection of the Artist.